Here are a few of my birchbox favs.. I subscribed a few months ago on a friends recommendation and I’m soooo happy I did. These are a few of my fav samples that I dug so much And purchased the full size! Model&Co Party Proof lipstick: I typically wear MAC and Yves St. Laurent lipstick but when I got a sample of Model&Co lipstick I fell in love. It goes on super smooth, it’s super hydrating and it smells terrific! (Unlike many other brands)I received the sample in neutral and I usually don’t do neutral. But this one was different and I liked it so much I bought the trio that comes in red, pink, and orange since I love a bold lip! Vasanti Brighten up! Enzymatic Face Rejuvenator exfoliating cleanser a Enriched with Papaya, microcrystals and Aloe- I love how this cleanser scrubs and exfoliates my face. You massage it onto your face for a few minutes after splashing some water on it. I just purchased a full size version since I used my sample up and I find myself missing it! It’s definitely going to be part of my morning routine! Beauty protector protect and detangler – I love this detangler/heat protector. I use hot tools on my hair almost everyday so I def need to use a heat protector. It smells amazing and a lil bit goes along way! Spray it onto damp hair after shampooing and conditioning and comb thru! 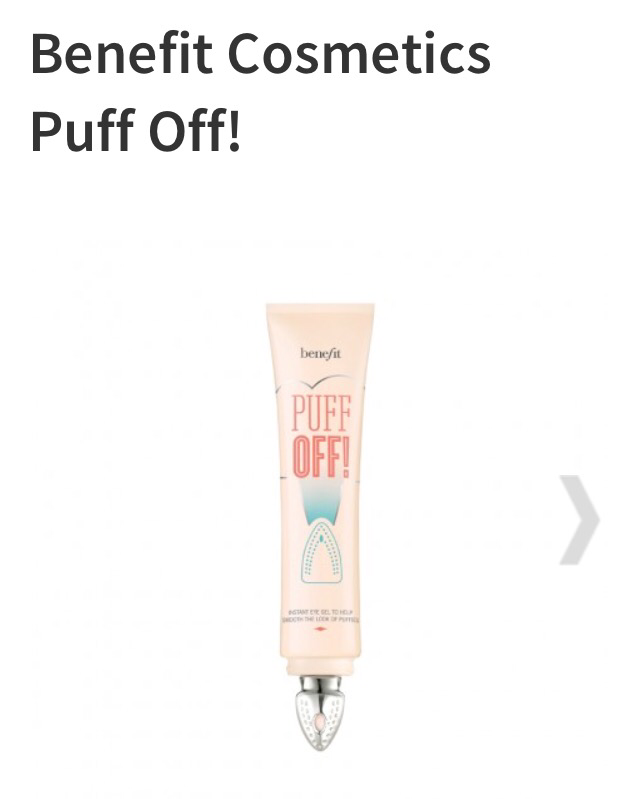 Benefit Puff off under instant eye gel- I love this stuff! I get a lot of under eye puffiness and I hate it! I have purchased tons of eye creams and products that do not work. It has a cool iron tip applicator that you use to smooth out your under eye bags! You can wear it under or over your makeup. I see results immediately! Def my fav new product. And the best part is I received it free using my birchbox points!